Russ Thurow, who works at the U.S. Forest Service's Rocky Mountain Research Station in Boise, spoke to an audience of almost 100 people at the Community Library at an event co-hosted by Idaho Rivers United and Lost River Outfitters. "The population collapsed," Thurow said. He said federal agencies attributed the decimation of the wild fish population to four H's -- harvest, habitat degradation, hatchery fish and hydropower development. Thurow's talk indicated that by far the most significant factor now is the last of those four. He said dams have entirely blocked fish passage to more than 70 percent of the original habitat in the Columbia Basin, and dams built on the Columbia and lower Snake in the 1960s and 1970s have had devastating consequences for both juvenile salmon headed to the Pacific Ocean and adult fish headed back upstream to spawn. "The slower the migration, the fewer that survive," he said. Once reaching the ocean, the fish do a long counter-clockwise trip up the coast of Canada and out to the Aleutian Islands, spending up to several years before returning eastward to the mouth of the Columbia to begin their spawning migration. Thurow said that due to a range of times spent by fish in both fresh and salt water, up to 18 age classes of spring and summer Chinook can spawn in the Middle Fork on any one year. He said that diversity of ages contributes to the population's resiliency. Thurow said the bad news for salmon in the Middle Fork is that redds, where eggs are deposited in riverbed gravel, have been reduced from possibly 17,000 to 20,000 in the 1950s to an average of 807 between 1995 and 2015. The good news, he said, is that the quality of the habitat remains very high, and if factors outside the drainage can be resolved, the potential still exists for the population to regain its original level. In fact, he said, biologists in the 1940s estimated that there's suitable gravel in the Middle Fork and its tributaries to support 92,000 redds. He said the Chinook population's potential resiliency is boosted by the fact that each female produces an average of more than 5,000 eggs. Fish spawning in the Middle Fork of the Salmon drainage reach the highest elevation of any spring and summer Chinook in the world, Thurow said, and that makes the area especially important to fish survival as the climate gets warmer. He said climate researchers have reported that high-elevation habitats like the Middle Fork are probably going to provide "cold-water refugia." "So Middle Fork stocks need to be a top priority for recovery in the overall Columbia River basin," he said. Judge Michael Simon ordered that a new biological opinion and full NEPA analysis of "all reasonable alternatives" be completed by March 1, 2018. 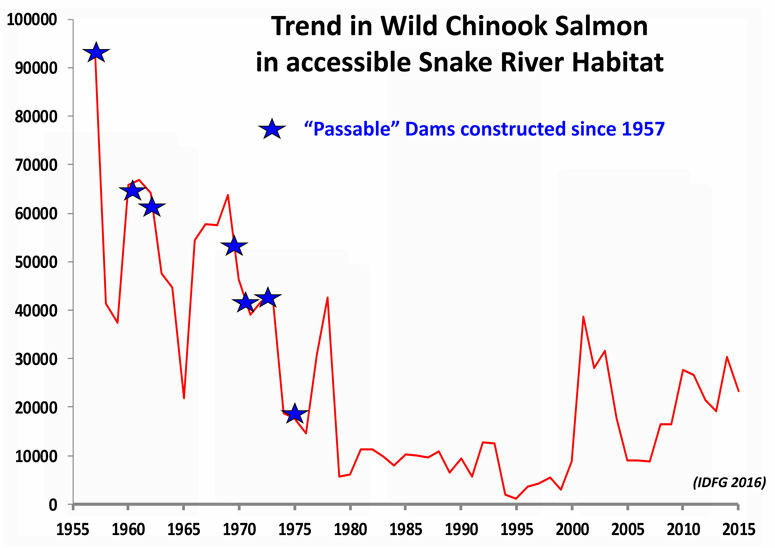 Though Simon stated that he was not ordering consideration of any specific alternatives, the analysis "may well require" consideration of removing one or more of the four lower Snake River dams. "This is where, if you're interested in saving salmon, get involved," Idaho Rivers United board member Andy Munter told the audience Tuesday. "It's time to get involved however you can in the public comment process." "The science has been settled for years," Munter said. "Now it's the economics." Local salmon advocate Scott Levy also urged people to get involved in a new recovery plan's environmental impact statement. "This is going to win," he said. "If you get involved, you can be part of making a huge change in Idaho."